Hot food and drinks will keep your guests cozy from the inside out. Check our Winter Warmers for lots of sweet and savoury ideas. Meat and/or vegetarian chili is a great winter dish. It will fill up your party-goers and can be kept hot in a crockpot. If you don’t have a favourite chili recipe already, look online for some great suggestions. Special drinks can be kept hot in a crockpot. See below for recipes. A hearty stew will go a long way to keeping your guests warm and satisfied. Serve with buns, and maybe even cheese. Poke each potato all over with a fork. Spread a thin layer of butter all over the outside of the potato. You can add salt and pepper, if you wish. Wrap each potato in two layers of tinfoil, then put in the coals of the fire for at least 30 minutes. Keep turning so they bake evenly. A favourite with seasoned campers! This tasty treat is fun and full of flavour. The preparation can get a bit messy, so you might want to get these ready inside. Your favourite chocolate cake or brownie batter. Mix your favourite chocolate cake or brownie batter. Fill one half of the hollowed-out orange skin with chocolate cake or brownie mix. Put the other half of the skin on as a lid and wrap the whole orange in tinfoil. Write names on the tinfoil with a permanent marker. Put the wrapped oranges in the coals of the fire. Keep turning until the cake batter has baked completely, then use a spoon to eat the orange-flavoured chocolate cake. Roasting marshmallows over the fire is popular year-round. 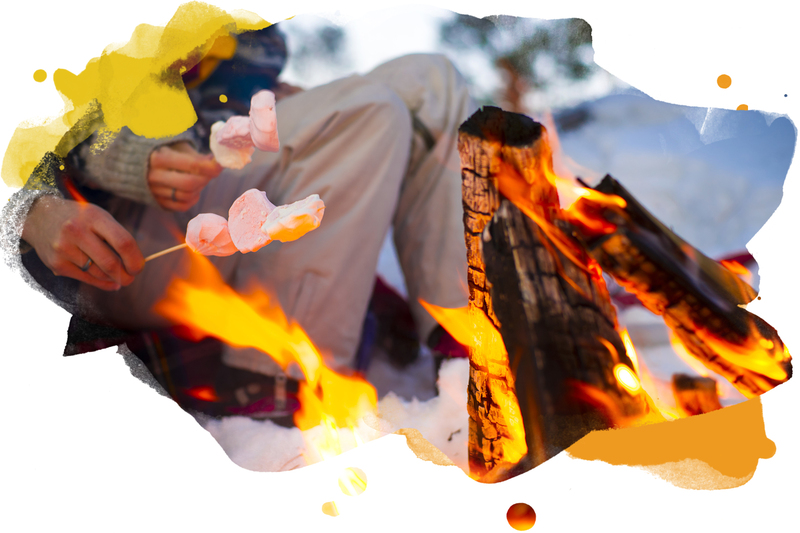 All you need is a bag of marshmallows and roasting sticks. Remember that this treat can get a bit sticky, so you might want to have some wet cloths for your guests to wipe their fingers on. Making s’mores is easier than pie. Start with a graham cracker, place a piece of chocolate on it, add your roasted marshmallow, and top with another graham cracker! Thin pieces of chocolate are the best to use so the chocolate will melt a bit from the heat of the roasted marshmallow. If you prefer your s’mores not quite so sweet, try saltine crackers instead of graham crackers – the cracker is plainer and adds a bit of salt to the mix, which is surprisingly good! Roasted wieners are just as tasty in winter as they are in summer. This is also an easy and fun way to have your guests prepare their own food. You might like to pick up a variety of hot dog wieners – pork, chicken, beef, tofu – to cater to your guests’ preferences. Remember buns, ketchup, mustard and relish! Ready-made hot chocolate powder and hot water is the easiest way to serve hot chocolate. But, why not spice it up and give your guests a special treat? Add marshmallows, candy cane pieces, or cinnamon. In South America, cayenne pepper or chili powder are added. Coconut milk adds a nutty flavour, or try a splash of orange juice and a dash of cinnamon for something different. There are many tasty recipes online, so have a look and try something new. An easy two-ingredient hot chocolate recipe! Makes two servings. Combine milk and Nutella in a saucepan. Bring to a simmer over medium-high heat (do not boil). Hot mulled juices have long been favourite winter drinks. Look for recipe books at your local library, or look online for inspiration. Here’s a family-friendly apple cider recipe to get you started. If you use unsweetened apple juice and you’d like to sweeten your mix, add 2 tablespoons of brown sugar or up to 1/4 cup of maple syrup. Mix the ingredients in a pot and simmer on the stove for about half an hour. Strain the cider before serving if you don’t want to get spices into the individual cups. If you’re at home, a hot toddy or mulled wine is certainly a nice way for adults to warm up. Try different juices, wine, spirits or even beer (yes, beer!) to create warm treats. Add crème de menthe, peppermint schnapps, or Kahlúa to hot chocolate. Spruce up a coffee with Bailey’s. Or add rum or whisky to hot tea. Of course, ensure that all of your party-goers who enjoy a spiked drink get home safely! Check with your community league hall for their alcohol serving requirements. Generally, alcohol cannot be served on parkland, but check with your NRC or F&E Liaison for special permission requirements. Pack clean snow into trays so that you have a surface to pour your hot maple syrup onto. Boil maple syrup and simmer until it reaches 240°F on a candy thermometer. Pour the hot syrup in thin lines onto the snow. Let the maple syrup sit until it starts to stiffen slightly, then roll lines onto clean popsicle sticks and eat. One litre of maple syrup will make enough tire for 5 – 6 people. Remember that boiling syrup is extremely hot – handle with care! Take some inspiration from Laura Ingalls in Little House in the Big Woods and make your very own snow ice cream. There are many recipes and flavours online, but here’s one you can try. For each serving of snow, you will need ½ cup of cream, 1-2 tbsp of maple syrup, ¼ tsp of vanilla extract, and a pinch of sea salt. Start by putting a snowball in a mixing bowl, add the cream, then a pinch of salt and maple syrup, and finally the vanilla extract. Stir it all together, and enjoy!